The Wairarapa Korus wilted under a strong Taranaki bowling battery in the final of the Central Districts women’s Twenty20 championship played at Levin on Sunday. 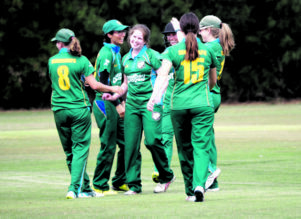 Korus bowler Olivia Roseingrave, centre, is congratulated by her teammates after taking one of her five wickets against Nelson on Saturday. The Korus made the final after beating Nelson, Manawatu and Hawke’s Bay in the preliminary round but could not handle the slow bowlers of the defending champions. Fielding first, the Korus made a great start with the ball to have Taranaki 49 for five in the 12th over. But a late recovery got Taranaki to 108 for the loss of six wickets off their 20 overs. Esther Lanser and Ocean Bartlett took two wickets each for the Korus. At just over five runs an over, the target seemed gettable but Taranaki’s spinners, led by former White Ferns captain Aimee Watkins, put an iron grip over the Korus’ batting. Off-spinner Watkins surrendered just 17 runs for her three wickets and found able support from Taila Hurley and Kelsey Husband who each got two wickets. Hurley also helped run out Gemma Sims as the pressure mounted on the Korus. Tahlia Jones-Dennes, 23, and Georgia Atkinson, 17, were the Korus’ leading scorers. 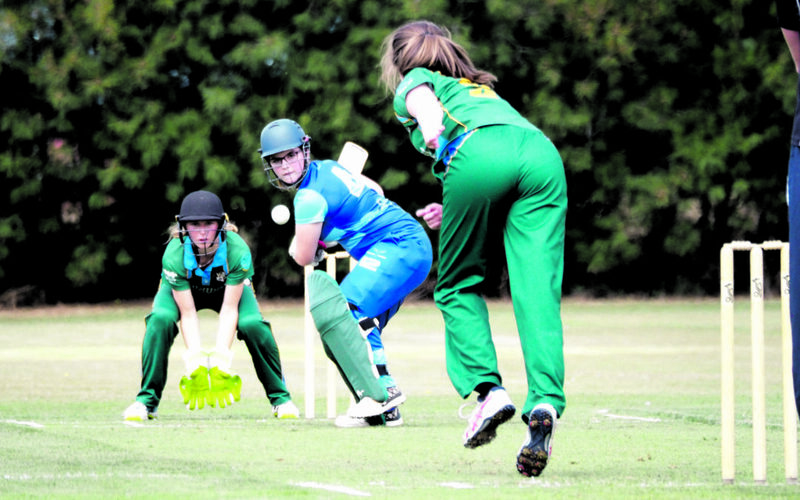 Korus captain Kerry Tomlinson said the side’s more experienced batsman had been tripped up by the slow bowlers. “Quite a few of us [Central] Hinds players are more used to batting the faster balls which mean you don’t have to generate as much momentum for the bigger shots. 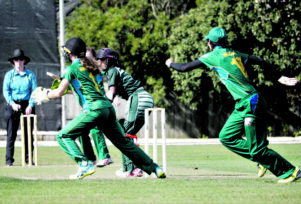 Wicketkeeper Gemma Sims and captain Kerry Tomlinson, right, on the move in the field against Manawatu. In their first match of the tournament, the Korus beat Nelson by four wickets with Olivia Roseingrave a standout, taking 5-11 as their opponents were bundled out for 46 runs. Against Manawatu, the Korus scored 106-4 before dismissing them for a 48-run win. Their third win, by five wickets against Hawke’s Bay, was built around a sparkling 60 by Melissa Hansen. Tomlinson made her captaincy debut for the Korus over the weekend with Esther Lanser, who had captained the side, previously stepping aside to allow her to gain experience. Tomlinson said that although the team had not won the competition, they had shown their strength on the pitch. “We had some really good bowling from Olivia Roseingrave as well as Melissa Hansen who was consistent in her bowling and batting. “Esther Lanser showed the younger ones all the right things to do. 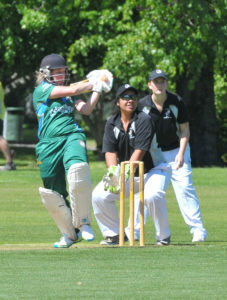 Hansen, who is also Wairarapa Cricket’s women’s development officer, said the team had a strong base of players. “We’ve got plenty of young talent in our team and many of them are playing rep cricket which just gives us good potential. Nelson 46, 16.2 overs [L Fuller 12, S Kersten 8; O Roseingrave 5-11, G Atkinson 2-3] lost to Wairarapa 47-6, 13.1 overs [M Hansen 16, E Lanser 16 no: C Green 2-1, S Wilson 2-10] by four wickets. Wairarapa 106-4, 20 overs [M Hansen 43, E Lanser 31 no; M Murray 1-9, O West 1-11] beat Manawatu 58-9, 16.5 overs [A Kumar 12, M Murray 12; M Hansen 3-6, E Southey 1-1] by 48 runs. Hawke’s Bay 134-4, 20 overs [M Scoular 63, C Pedersen 29: A Fitzgerald 2-5, M Hansen 2-12] lost to Wairarapa 135-5, 18.2 overs [M Hansen 60, E Lanser 33: C Pederson 1-26, F Devonshire 1-30] by five wickets. Taranaki 108-6, 20 overs [S Elliott 42 no, A Watkins 11: O Bartlett 2-11, E Lanser 2-18] beat Wairarapa 78, 16 overs [T Jones-Dennes 23, G Atkinson 17; A Watkins 3-17, T Hurley 2-8] by 30 runs. Final Standings: 1 Taranaki, 2 Wairarapa, 3 Horowhenua-Kapiti invitational, 4 Manawatu, 5 Hawke’s Bay, 6 Nelson.